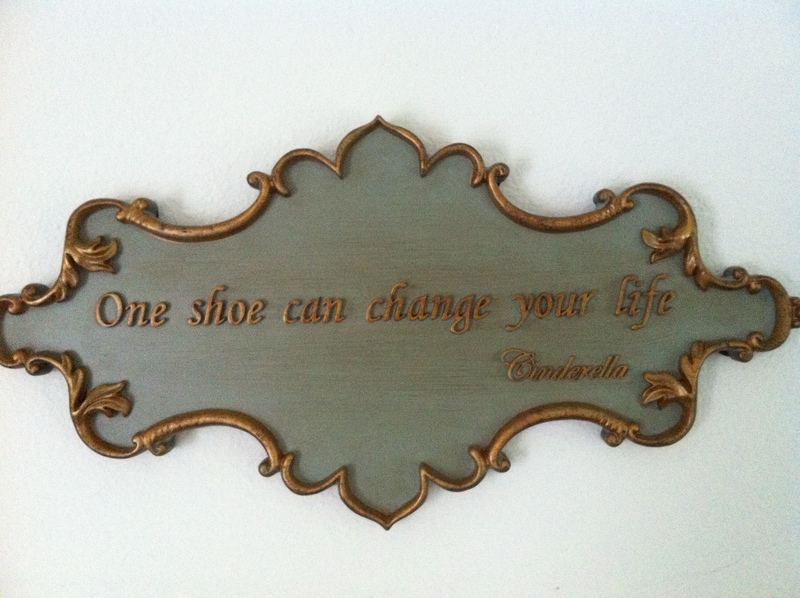 “One Shoe Can Change Your Life” – Cinderella «Miss um... Erica?!?! Miss um… Erica?!?! My sisters grew up dancing as well, and my mom spent hours a week on the road between the dance studio and the house since we were there every day of the week and usually weekends as well. One year we TOTALLY dominated the Christmas Rudolph performance. It was a Sister Act because from beginning to end, at least one of us was in every scene and surely as entertaining as Whoopi herself. My most memorable performance however was Cinderella. I got to perform a pas de deux as one of the Autumn Fairies with my friend. As only I would do, I found myself chatting it up backstage with one of the cute stage hands and missed my cue. What made me realize that I had missed my grand entrance you ask? Well, it was the giant THUD that came with the landing of Cinderella’s pumpkin. My partner was performing and tossed the big orange ball into the air blindly behind her expecting me to be there to catch it as rehearsed. Guess what. I was not. MORTIFIED, I galloped onto the stage and attempted to save the show. Remember the big Saturday Night Live performance when Ashley Simpson got cold busted lip syncing and did that bizarre little thumbs-out-wiggle attempting to save face and then blamed her BAND? I guess my scene unfolded a little like that. I flew in from the wings and faced the BACKDROP. And CRIED. But I still SMILED through the tears at NOBODY and MADE UP a bizarre little ditty like some comedic poltergeist had taken over my body while my teacher stared in total HORROR. I couldn’t even look at her. Eventually her voice broke through my fog, and I finished the second half of the dance as choreographed. God! It was like watching an awkward Ben Stiller movie, I’m sure. Picture him now in pink tights and a tutu and pointe shoes pirouetting. Not a pretty sight, but back to my point. Not a soul could cushion the fall from grace in those pink soles. I call that vivid memory, The Great Pumpkin Dance. And the first sounds of my teachers instructions were garbled like the Teacher from Charlie Brown. God, what a nightmare. Boy, I bet she misses me now, huh? If I have you on overload with my wordsmithing here, then tough. My brain works like that Bing! commercial and this is MY blog so you can keep up or step away. By the time I sashayed into my “gifted” school my junior year, I think I was still suffering from PTSD from that dance and was looking to discover new things. When none of the dance classes fit easily into my school schedule, I chose to sit it out and maybe leap back in at a more CONVENIENT time. When the dance teacher at the new school heard that I had simply decided not to participate in any of her classes, she reacted by marching over to my dorm and ripping me a new one. She said that SHE had been the one to get me into that school and that I had only used my dance talents to gain acceptance and then had not followed through on my committment. She did not want to accept my decision. I was like 16 and exercising my independence in whatever way I could and thought she should’ve buttoned her tutu hole. I’m pretty sure I cried and was more than a little embarrassed that my character had been questioned in such a way. But THEN my embarrassment came out as anger. And I went to the director demanding to know if I was indeed being some sort of fraud. He calmly and patiently brought me down a notch and said simply that he would love for me to work a dance class into my schedule somehow but that I got MYSELF into that school. Nobody else did it for me. Enough said. Anger diffused. I enrolled in a class and everyone was happy. Sort of. I participated in the classes as instructed though I don’t think my heart was ever really in it again. I was just going through the motions. My grand finale in the dance department came with a school assembly performance. Somehow I missed a step and compensated for my embarrassment with the only way I knew how at the time. I LAUGHED. I giggled throughout the rest of the performance. I guess I was trying to act cool like it wasn’t a big deal and not important to me anyway. You know what though? It WAS important to the other dancers with whom I shared the limelight and it WAS important to the director. This was HER show – not mine. And I screwed it up. Just because I didn’t care enough to take the dance seriously didn’t mean that I could hog the spotlight and make the thing look like a farce. How was anyone supposed to focus on the other dancers while trying to figure out what in the world the giggle box was laughing at. I think overcoming self-induced embarrassment is probably a little easier to handle than when it is dished from someone else’s hands. Remember my outrage when she humiliated me at the dorm? Well I had just done the same to her only I did it in front of an audience. This time, SHE was the one who was mad and her embarrassment had morphed into rage. I could hear her screaming my name all the way up the stairs to the 2nd floor studio. Oh, well. I’m sure she got over it. The show must go on, and that was my cue to exit the dance theater for good. Here’s where I’m finally going with all of this: It was my ballet shoes that changed MY life in some ways, and the calouses that formed made me stronger. If you consider life like one big performance, then you have to know when to lead and when to follow. You also have to know when to go solo and when to share the spotlight. When we get embarrassed, it’s OK to laugh at ourselves. Embarrass other people though, and we can expect them to get angry. Sometimes all you can do is apologize, curtsy as gracefully as you can with your head UP and exit the stage. Your pumpkin will turn into a coach sooner or later as long as you don’t keep dropping the ball. Need this for daughters wedding…do you have one for sale or know where I can find one? in penning this blog. I’m hoping to check out the same high-grade blog posts from you in the future as well.